If you follow me on Facebook and Twitter you will know that I visited the Imperial War Museum earlier this week in the company of Elaine Everest, Viv Brown and Sarah Craven. While the historical period I am hoping to write about wasn’t represented, I had a wonderful time at the ‘Fashion on the Ration’ exhibition. Here is Elaine to tell us more about it. When my students mentioned ‘school trips’ during the summer break from The Write Place I suggested the Imperial War Museum as I had an ulterior motive – the ‘Fashion on the Ration’ exhibition. My sagas are set in the 1930s and 1940s so to be able to see garments up close from the era was a chance I couldn’t miss. I wasn’t disappointed. I felt as though I’d stepped back in time and could see many of my ‘girls’ wearing the frocks and underwear on display. Peggy from Gracie’s War was the perfect example of the women who were advised to ‘make do and mend.’ As rationing was introduced women had to be inventive in order to look smart and keep up their morale. In my forthcoming book, The Woolworths’ Girls (Pan Macmillan, March 2016) Maisie, one of my Woolies girls, is a keen dressmaker and could be relied upon to turn any second hand item of clothing into something chic for herself and her friends. ‘Keep up the morale of the Home Front by preserving a neat appearance.’ (The Board of Trade 1940) could have been written for Maisie! My one worry as I walked through the exhibition was that I’d made a mistake. Was I right to have my young bride, Sarah, wear a nightdress made from a whisper of satin on her husband’s return from fighting the enemy? As I turned a corner and faced a display of undergarments and nightwear I knew my research was spot on. In front of me was a mannequin wearing the very garment that Maisie made for her best friend. 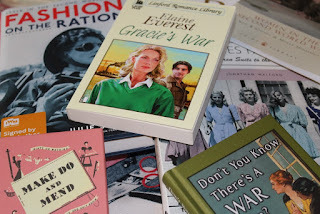 Even if you don’t write historical fiction I recommend a visit to the IWM for a dose of nostalgia before the exhibition ends at the end of August. Thank you, Elaine. And now for a trip even further back in time. On my journey to the Imperial War Museum I immersed myself in quite another period of history. What amazing facilities are available to those of us who wish to write about an age other than the one in which we live. Here is what I did. The postman doesn’t deliver very early these days but he came up trumps on Tuesday morning and my excitement mounted as I opened the envelope because I knew what it contained. I had ordered a copy of Louise Allen’s Walks Through Regency London. There’s a big hint in the title! I (along with many others) am a huge fan of Georgette Heyer and my ambition is to write a romantic novel set in the capital in Regency times. While I acknowledge that the Kindle and its equivalents are a great boon to the reader on the move I decided to order not the ebook but the slim volume I now have in my possession. I wanted to be able to flick the pages; to look at the images; to jump from one place to another with ease. There are ten walks, each of approximately two miles. Such is the detail that I only had time to study the first walk. So engrossed was I that I nearly missed changing trains at Waterloo. A nice touch that, Waterloo, since it fits so well into the time frame. The detail is quite extraordinary. Because it is essentially a guide book I had expected it to be quite dry. Here is where I apologise to Louise Allen because it’s no such thing! It’s interesting, evocative of its time and it drew me straight into places I know so well from between the covers of my heroine’s books. Even as I type this I am becoming more excited because the first walk is named St James’s and it starts at Green Park Station in Piccadilly. It just so happens, and this really is a coincidence, that I am meeting my sister this coming Friday afternoon in that very area. I will travel up to London in the morning with the book in my handbag and sample the first of what I know are going to be huge treats. I expect it won’t be long before my copy is covered with notes, highlighted in yellow and curling at the edges. I make no apology for this. It’s a book that's meant to be used. In the meantime, huge thanks to Louise for all the footwork (sorry!) she put in. I have already gained a great deal of pleasure and I haven’t even started yet! Guess what my next blog’s going to be about. The Imperial War Museum can be REALLY helpful if you need to search records. You can't just turn up and search their Library - you have to make an appointment. You write and tell them your area of interest, and they come back with a suitable date & time. My "areas of interest" were the Battles for Ctesiphon and Kut in the Mesopotamia campaigns in WW1. When I arrived at the Museum I was directed up to the Reading Room in the cupola. There I found a desk had been set out for me with a pile of boxes and books, all relevant. After a full day there, in the last box I looked at, I found a typewritten memoir of the battle which actually mentioned my Grandfather, Lt. Col. Cyril Jackson, who was killed there. The author mentioned that he (my Grandfather) had been cut down by the Turkish machine guns. The two of them had planned on visiting some of the ancient ruins around Ctesiphon and Bahgdad. If any other member needs to do some research there, I really recommend the place. Wonderful that you got so much out of your visit, John. The trouble with research is it's so interesting that sometimes it's easy to get side-tracked. I find it's important to keep focused or time runs away with me. Easy to say - not quite so easy to do. Superb, Natalie. It's wonderful to 'hear' your enthusiasm and you certainly transmit it to the reader. You're on such an enjoyable journey. Hang on.... but no, I can't keep up but shall follow you with awe and interest. I was sorry I couldn't make it on the trip to the IWM, Natalie. Your new book sounds utterly fascinating. What a wonderful resource for you. Good luck with your Regency novel. Since posting this blog, Sheryl, I have experienced just half of the first walk and gained a huge amount from it as well as having a lovely time in the process. Who knew research could be so enjoyable! I'm feeling quite jealous - there is nothing quite like research that is not done online. I will soon be travelling to Geece to add the final authentic touches to my own novel.